La Bete Humaine… | Hard News, decadent squealing of a wolf in pig's clothing and rhymes. The narrative centres on a society which lives and breathes a section of the French railway system. Focusing mainly on the Company’s employees the author brings to life the essence of train drivers, signalmen, firemen, conductors, and the faraway board of directors. Landscapes are painted in words with the skill of an impressionist canvass-artist who whilst at the top of his form, suddenly decided to swap his easel for a quill. 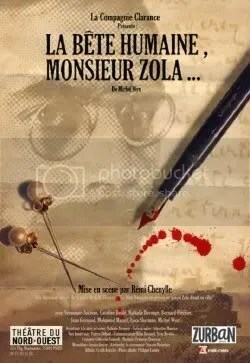 The geography and ambience is brilliantly rendered throughout, giving the reader that much sought after feeling of being there, in the pages, as a silent observer of the corruption, bloodlust, infidelity and suffering which plagues and shapes the stories of the brutal Rombaud, the genetically disturbed Jacques Lanteau and co.
Zola took great care in elucidating to the mechanics of the railway system. The movement and engines of the trains, the hardships of existing in a world dominated by coal dust, grease and burning hot steam. Rather than diluting the thrust of this tale of Instinct v Civility, understanding the intricacies of reversing gears and coupling rods adds to the overall reading experience. Brilliantly written. Definitely worth a pop for anyone with eyes and a half decent grasp of the English language…Especially interesting for those, like myself, who make little distinction between the clothed and unclothed beasts of this world. This entry was posted on Thursday, November 8th, 2007 at 1:11 pm and is filed under Essays and other musings of a madman....	You can follow any responses to this entry through the RSS 2.0 feed. You can leave a response, or trackback from your own site.